Every once in a while, I just don't have the time to put a lavish meal together for my hungry, little army. And on those days, I head over to Costco or Fred Meyer's and purchase their whole, slow roasted chicken, and then I'll serve it with a side of steamed veggies. More often than not, I will usually have leftover chicken that's been tucked away in the fridge and forgotten, only to be found a week later. Woopsy daisy, I guess in the garbage, it goes!! NOT ANY LONGER! I've recently come up with my new go-to recipe for leftover chicken! THEY TASTE AMAZING and my kids absolutely love them!! They call them..."the yummy puffs!" Lol! 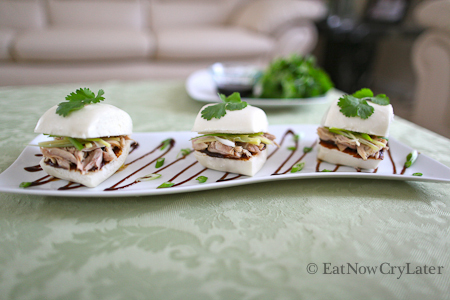 If you're familiar with Peking duck on steamed buns(pancakes)with a sweet hoisen sauce, then you'll love this one cause the only difference here, is that I use chicken!! A MUST TRY RECIPE! On medium high heat, add in some olive oil into your hot pan. Next, add in your ginger slices and stir for a few seconds. Add in a little sugar, salt, black pepper, and fish sauce to taste. Fry until crispy. Set aside. In a mixing bowl with your shredded chicken, add a little bit of salt, sugar, black pepper, onion powder and fish sauce. Next, add just enough chicken stock to re-moisten your chicken. Taste check. Don't make it too salty though, because you will get most of the flavor from your hoisen sauce! On medium high heat, add some olive oil and throw in your garlic. Stir fry it a little bit, and then add in your chicken. Heat it through and taste check once more. Remove and set aside. Using the same pan, add in your hoisen sauce. Next, add a splash of sesame oil, but don't overdo it. Then, add in some brown sugar to taste. Finally, move your pan over to your stove, and on medium low heat, stir your hoisen sauce paste, just until all the brown sugar dissolves. Remove and place into a small, serving dish. And that's all folks!! All that's left is steaming up the buns! This is a fun dish to make cause then all of your guests can assemble their own mini sandwiches, as they please!! 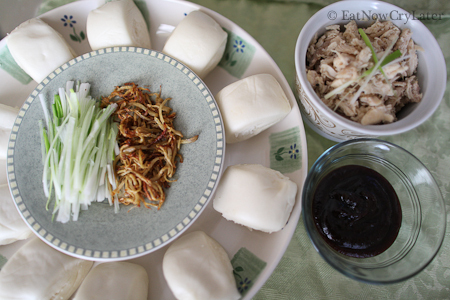 Notes: You may replace fish sauce with soy sauce if you're not a fan. The type of hoisen sauce really does matter in this case. I highly recommend the Koon Chun brand. If you're super lazy, then you probably don't even need to add any additional flavorings to it. Other brands are a lot saltier, and just don't taste as good! Be careful NOT to over season your chicken! You will get a ton of flavor from your hoisen sauce. Also it's best to slice your buns while they are cold. Remove your frozen buns from the freezer, wait 10 minutes and then slice them. If you slice it after you've steamed them, they become difficult to cut because they are so soft.